Got a baby shower to go to? Just found out you are going to be an aunt, like me? (Whoo-hoo!) Well, online retailer Noble Carriage is determined to take the guesswork and the running around out of shopping for certified organic baby clothing and gifts. They stock a range of pre-selected organic gift bundles or you can purchase multiple items from their store and they'll turn them into a beautifully packaged custom gift bundle for just $8 extra! Read on for details. Noble Carriage was created as “a platform to introduce the world to the best and most sustainable baby clothing that exists.” Aware that even clothing labelled organic may not be completely free of toxins, nor necessarily sustainably or ethically produced, the company has set strict standards for its products. All clothing they stock must be organic, plus meet three out of their four “Noble Standards”: to be sustainable, fair trade, handmade or certified organic. The site’s pre-selected gift bundles are generally limited edition, with some also including a $10 pledge to the charity: water initiative, providing clean water in developing countries. At time of writing there are four gift bundle options available, covering boys’, girls’ and unisex gifts. Each bundle includes items of clothing and a toy or organic wooden teether, all lovingly boxed up and ready for postage. 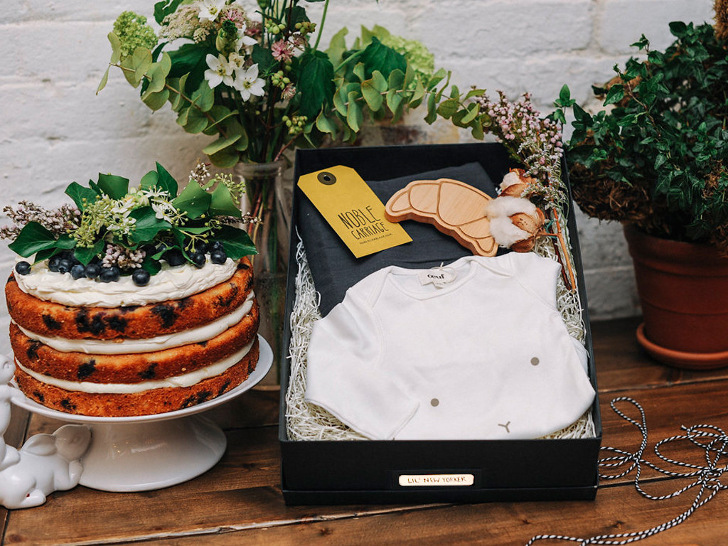 Noble Carriage stocks brands such as Oeuf, Goat-Milk, Lexypexy, Hazel Village and Briar Handmade, so if none of the pre-selected gift bundles quite hits the mark, you can create your own custom gift bundle order from any items on the website and they’ll package them up for you in a flash. Pre-selected gift bundles start at $82, ranging up to $129 depending on clothing size and combination. Custom gift bundles are limited only by your imagination, but all gift bundles ship free within the US, with the added bonus of free returns if something doesn’t quite suit the recipient. If you sign up as a new subscriber to the Noble Carriage newsletter, you’ll also get 10% off your first purchase. RELATED | GREEN RANT: Why is it so Hard to Find Eco Clothing for Boys? Noble Carriage was created as "a platform to introduce the world to the best and most sustainable baby clothing that exists." Aware that even clothing labelled organic may not be completely free of toxins, nor necessarily sustainably or ethically produced, the company has set strict standards for its products. All clothing Noble Carriage stocks must be organic, plus meet three out of their four "Noble Standards": to be sustainable, fair trade, handmade or certified organic. The site's pre-selected gift bundles are generally limited edition, with some also including a $10 pledge to the charity: water initiative, providing clean water in developing countries. At time of writing there are four gift bundle options available, covering boys', girls' and unisex gifts. Each bundle includes items of clothing and a toy or organic wooden teether, all lovingly boxed up ready for postage. Noble Carriage stocks brands such as Oeuf, Goat-Milk, Lexypexy, Hazel Village and Briar Handmade, so if none of the pre-selected gift bundles quite hits the mark, you can create your own custom gift bundle order from any items on the website and they'll package them up for you in a flash. Pre-selected gift bundles start at $82, ranging up to $129 depending on clothing size and combination. Custom gift bundles are limited only by your imagination, but all gift bundles ship free within the US, with the added bonus of free returns if something doesn't quite suit the recipient. Sign up as a new subscriber to the Noble Carriage newsletter, and get 10% off your first purchase.